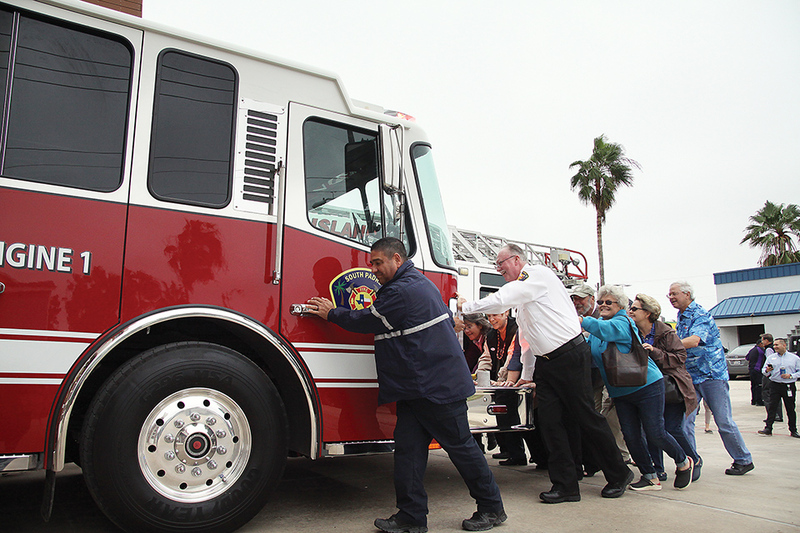 The South Padre Island Fire Department (SPIFD) welcomed the arrival of its newest piece of equipment by hosting a traditional “push in” ceremony Tuesday afternoon. The new arrival is a 2019 Ferrara Cinder Custom Pumper capable of holding 1,000 gallons of water and pumping 1,250 gallons of water per minute, Fire Chief Doug Fowler said. In addition, the truck holds over 2,000 feet of hose. The state of the art fire engine cost $450,000, according to a statement released by the City of South Padre Island. “It takes about six months to build but it is well worth the wait,” Fowler said. The push-in ceremony Tuesday gave the department a chance to celebrate the new truck with members of the community and harkens back to the times when fire services consisted of horse drawn carriages, Fowler explained. “As part of tradition and the fire service, we bring in the community and we have what’s called a ceremonial push-in. In the horse drawn (carriage) age, when the horses brought in the apparatus after the fire, they would detach the horses and they would push the apparatus in and that’s kind of where it stemmed from. But, it’s been a long, long tradition in communities because we put a lot of assets into public safety and so we like to have these celebrations when we get new equipment,” he said during an interview after the ceremony.